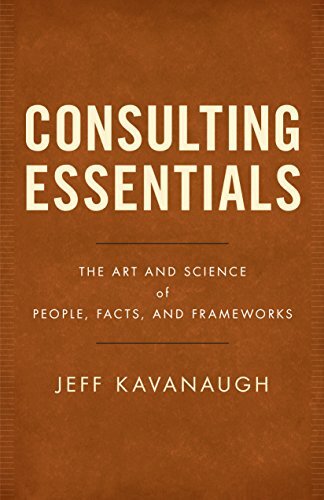 By @SimonCocking, review of Consulting Essentials: The Art and Science of People, Facts, and Frameworks, by Jeff Kavanaugh available from Amazon here. How do you become a world-class consultant? This is the question on the minds of thousands of young consultants as they graduate from the classrooms of the world’s business schools to the offices of top consulting firms. Yet, few of them have been formally trained on the concepts that elevate consultants to the top of their field. Drawing on his experience as a senior partner at a multi-billion dollar consulting firm and adjunct professor at the University of Texas at Dallas MBA program, Jeff Kavanaugh is ready to share the tools of the trade for young professionals to quickly scale the consulting learning curve. Pulling together the best content from his own experience, as well as other world-class consulting leaders and industry professionals he has worked with, Kavanaugh has distilled the lessons into the key skills that separate the best from the rest. Great book, terrible cover. There is a lot to like in this book, and thankfully it rewards persisting beyond such an odd choice for its cover. Once inside there is a lot which helps to distinguish it from many of the anodyne business books we have to read and review. The author’s approach is a positive illustration of a change in mindset in terms of knowledge and expertise. Previously this would be zealously guarded and not shared out. Whereas the best and the brightest now understand that engaging with people, explaining their own journey, and sharing the insights they learned along the way does not diminish their own market value, but actually enhances it. Not everyone feels this way, and we can still think of several ‘experts’ who would never deign to reply to emails or requests for advice or information. Thankfully Kavanaugh’s book has been written from the opposite perspective. With this attitude clearly demonstrated in the introduction as the author explains how he got started, and why he got interested ‘in making companies do better’, he then engages you to come along for the ride. Consultants, and consultancy services have got themselves a bad name at times, but when done well, they do offer real value and actionable business insights for the companies they work with. This book takes you through a systematic review of how consultants can and should help and give advice. As an advisor too now as well, I found the book useful personally, and also of value to a wide audience. He also discusses future proofing your skills, the importance of learning ‘enough’ in completely new fields to be able to give relevant and useful advice. Data analytics are covered, as well as how to deal with and relate to people. At 400 pages it is a longer read for a business book, but with good reason as he aims to offer value across a range of areas. There is even a final section on how to approach interviews for those looking to nail their first consultancy roles. It’s a good book, a good read, and an author worth watching out for. Previous ArticleNew Technologies to Make Irish Debut at Manufacturing Solutions 2018.